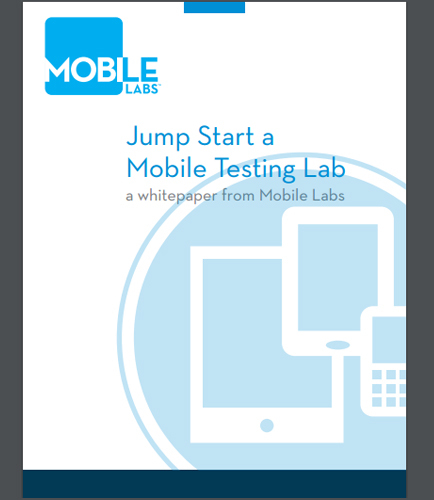 "Mobile Labs:How to Jump Start a Mobile Testing Lab Successfully"
Starting a mobile lab and Initiating a testing program for enterprise mobile apps can look like an impenetrable wall. Mobility presents new challenges that, once understood, do have logical solutions. The most successful mobile enterprises manage to retain the traditional goals of QA testing, while incorporating new requirements brought forth by mobile labs, and solving new challenges that mobility imposes on workflows, devices, developers, testers, and users alike. Mobile Labs to test with real devices on real networks. Use a secure, private mobile devices for your Mobile Labs to support both manual testing and automated testing. Don’t automate everything: Know what makes sense to automate and what makes sense to do manually. Know what you are testing when you first start your Mobile Lab. Integrate the tools that you know into mobile testing. How to establish a successful Mobile Lab Testing Program.